Commencing at a point on the Western boundary of Upper Harbour Street, the said point being most east¬erly corner of lands registered at Volume 514 Folio 12; thence south westerly along the southern boundary of the said lands registered at Volume 514 Folio 12 to its most southerly corner, thence south westerly on a straight line to a point on the eastern boundary of the main road leading from Wakefield to Falmouth that said point being due east of south eastern corner of lands registered at Volume 931 Folio 166 in the name of Seivwright Building Supplies Limited at the bottom of Market Street and includes both sides of Market Street; then northerly along Market Street to the earth drain then in a westerly direction following and including the earth drain to the Montego Bay to Falmouth main road, then in a south westerly direction along the said main road to the point in line with the southern bound¬ary of the cemetery, at the foot of Wellington Street, thence due north crossing the abovementioned Montego Bay to Falmouth main road to a point on the coastline at Half Moon Bay; thence generally, southerly, south easterly, north easterly and south easterly, along the coastline, and including all jetties, to the north eastern corner of lands registered at Volume 205 Folio 76 in the name of the Trelawny Parish Council; thence south westerly along the southern boundary of the said lands registered at Volume 205 Folio 76 to its westerly across Upper Harbour Street to the point to commencement, being lands situated at Falmouth in the parish of Trelawnv. Falmouth is the capital of the parish of Trelawny, which is on the north side of western Jamaica, and it is essential that we know the origin of Trelawny in order to understand the history of Falmouth. Trelawny was formed by an act of the Assembly of Jamaica in 1770, and Sir William Trelawney, the then governor, signed the momentous act on December 29 that year. To demonstrate their gratitude, the parishioners named Trelawny after the governor, as they had been lobbying the Assembly for their own parish since the early part of the eighteenth century, and the governor's backing was instrumental in their achieving success. The 'e' that is missing from the name of the parish was an error on the part of the eager parishioners that has never been corrected. Originally, Trelawny was a part of the parish of St. James and the first bill proposing a division of that parish into two separate parishes was presented to the Assembly in 1733. The opposition to that bill was simply amazing and the debate in the Assembly lasted for only one day. After that, the bill was rejected, due to the refusal of Major General Hunter, the then governor, to endorse it. Governor Hunter did not perceive dividing St. James at the behest of certain members of the parish to be a reflection of the general political will of the colony. As his title suggested, Governor Hunter was an accomplished military figure, but as a colonial administrator, the promoters of the bill probably perceived him as less proficient. In 1733, Jamaica was already divided into three counties and seventeen parishes (see the Eighteenth Century Map of Jamaica). The county of Cornwall in which St. James is located contained 771,473 acres of vacant and underutilised land. The subsequent migration of sugar planters to the north side of the island stimulated the development of the county. By 1739, the county contained 143 working estates. In 1768, this number increased to 265. By 1772, the total was 344. This means that between 1739 and 1772, there was an average increase of sugar estates in the county amounting to 228. More than three quarters of the estates comprising this number was located in St. James alone, which was why the agitation for a new parish erupted there (see the Map of Jamaica, c.1793). The rapid growth in the number of estates tremendously increased the value of St. James, but as planters in the hinterland experienced considerable difficulties transporting their produce to the port at Montego Bay, and because this was happening at the same time that the trade with North America was booming, it caused great discontentment among them. Isaac Dookhan, in a valuable little book, The United States in the Caribbean (1985), reports that between 1682 and 1774, the value of this trade with North America grew by 77 per cent. Its continued growth, however, depended on how quickly planters could reach the port and what volumes of their produce would survive the journey. In the hinterland of St. James, the transportation problem was twofold: the long distance to Montego Bay and the poor condition of the roads. The planters undertook the construction of the roads and almost all of them were crudely built. In addition, they became waterlogged whenever there was continuous rainfall and this made them more difficult and dangerous to traverse. The poor construction of the roads resulted from the shortsightedness of the planters. All planters wanted to make a profit on their investment, but the culture of greed was explicit in the northwest, for this was the main reason why they migrated there. Road construction, therefore, was not a priority. The planters who undertook the long journey to Montego Bay despite the rainfall often had to satisfy with selling less produce than what they had started the trip hoping to sell. Water transportation, unfortunately, was not a viable alternative, at least not until the advancements in shipping technology which came later. The planters who tried it discovered that a number of the rivers on the north side were not always suitable for transporting estate produce over long distances, namely rum, sugar and molasses. Many of these rivers were often in spate, some were too fast flowing, others were irregular and filled with rapids. The planters occupying the eastern part of St. James were the first to raise the matter of dividing the parish. Apparently, this was where the transportation difficulties existed. The planters in the western part opposed the idea. It seems they were not faced with transportation troubles, even those who owned properties in the hinterland. The planters in the western part also feared that a new parish would create a port town that would rival Montego Bay, and this was perhaps the most important reason for their objection. A number of parochial meetings were convened at Montego Bay and elsewhere in St. James to cut short the agitation of the easterners for a division of the parish. The point concerning the negative impact a new port would have on the trade of Montego Bay received a lot of attention. Nevertheless, the easterners persisted. As the controversy unfolded, it became clear that St. James as a parish was already divided and an act legalising this division would only rubber stamp what everybody already knew to be real. In fact, the act of 1770 was a mere political formality. At the time of its formation, Trelawny measured approximately 304 square miles and this made it the fifth largest parish in Jamaica. Some 33 square miles was well-watered and undulating land and nearly all of this was over 2,000 feet above sea level. At no point, however, did it exceed 3,000 feet. About 166 square miles was less than 1,000 feet and 135 square miles was between 1,000 and 2,000 feet. 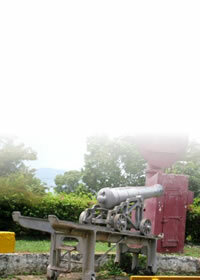 Martha Brae Village, not Falmouth, was the first capital of Trelawny. It was chosen shortly after 1770, and its appeal was based on its history and location. The Spanish settlers founded Martha Brae Village as a way station to and from the northwest coast of the island. It was one of the few Spanish settlements that survived the British conquest in 1655, not that the British had deliberately set out to destroy any of the existing Spanish villages. Martha Brae Village was simply left alone when the British began to settle the colony. Its close proximity to Martha Brae River made transportation cheap and relatively easy, and one of the first official tasks of the Town Council of Trelawny in 1772 was to clear the river of obstructions, so that boats and barges could safely navigate its waters. This highlighted the importance of the river. Larger sailing vessels would have to empty at the Rock, a smaller settlement near to the coastline. Smaller boats would then transport their cargo two and a half miles up the river to the capital. The coastline, as much as it could, before the rapidly expanding trade of the new parish outgrew it, facilitated the exportation of all types of estate produce. Martha Brae Village suffered from a number of significant weaknesses. One was that it had only 50 acres of land and all of this was on high ground. If Martha Brae Village was to become a major port town in the northwest, then 50 acres of land was not enough. As the population increased, the town would outgrow the available land space, so a different capital was needed. Martha Brae River was also the only route to its coastline, which was navigable for no more than two and a half miles. The alternative in this instance was land transportation, but again this meant incurring additional costs for the construction of roads, and as pointed out earlier, planters in the area were not eager to incur additional costs, unless, of course, those costs were absolutely necessary for the survival their businesses. There was a large bar of silt across the mouth of Martha Brae River, which at times prevented some small boats from entering. The coastline itself was a bit narrow, and this limited the number of ships that could dock there at any given time. Recognising the need for a new capital, the Trelawny Town Council established a Commission to look into alternative locations. Edward Moulton Barrett was selected chairman of the Commission. It is not known if he used his position as chair to influence the decision of the Commission, but the land on which the new capital was built after 1790 curiously enough belonged to the Barrett family and was called the Barrett Lands. If it was that Moulton Barrett used his position for personal gain, then the notion that history never repeats itself means little in Jamaica. On or before 1780 houses of Georgian architecture began appearing on what were then the Barrett Lands. Georgian architecture was in vogue in eighteenth century England, and as a fashion statement many wealthy colonials when building their homes in the tropics adopted the style. Essentially neoclassical, Georgian architecture was named after the kings of England, George I, II, III and IV, who reigned from 1714 to 1830. Its influence was particularly strong in America, where it became known as the Federal style, but mostly after their independence in 1776, and in the Caribbean colonies. Georgian architecture was linked to classical Roman and Italian architecture, and particularly to the work of Italian architect Andrea Palladio (1508-1580), who was responsible for its return in the 1500's. Palladio's influence can be seen in the designs of seventeenth century English architects Indigo Jones, Christopher Wren and others, and his essays, I Quattro Libri dell'Architettura (1570), were widely read. A typical building constructed in the Georgian style had three basic characteristics: simplicity in form, symmetry and detailing. Georgian buildings, especially those built for public purposes, have been criticised for their cold formality, but some people see this as evidence of their symbolic character, which makes Georgian buildings useful as government structures, churches, colleges and generous private abodes. Demure looking wooden houses constructed in the Georgian style bordered Market Street, the main thoroughfare in the new capital, Barrett Lands, also known as Barrett Town, Martha Brae Point and Palmetto Point Pen. The columns on the front of these houses were simple but prominent, and some of the basic concepts associated with the Georgian style, like the sash windows, hip roofs and quioning were evident. The undulating topography of the Barrett Lands facilitated the construction of these houses, which were later modified with the addition of verandahs, eaves, louvres and colonnades. These vernacular modifications were added for comfort and to improve ventilation since the tropical climate was harsh, even though the area was next to the shoreline where it could benefit from the sea breeze and access sailing ships without difficulty, an advantage over Martha Brae Village. The entire town measured 150 acres, another advantage over Martha Brae Village, and was built according to the gridiron plan. Except for the oldest part of Kingston, and later, under British influence, Spanish Town, Trelawny's new capital was the only town in Jamaica at the time that was built in accordance with the gridiron plan. In other words, the town was divided into square and rectangular blocks, separated by vertical and horizontal streets, similar to a chessboard, then subdivided into lots which were sold (see the Plan of Falmouth). Florida, the southern most state in mainland America, was built almost entirely in accordance with the gridiron plan. There was no other town in Trelawny that could compete with the Barrett Lands for the privilege of being named the new capital. Moulton Barrett wanted to christen it Barrett Town, like its colloquial name, but the parishioners objected. Instead, they preferred to continue the honour given to Governor Trelawney and name the capital Falmouth, after the governor's birthplace in Cornwall County, southwestern England. There was another Falmouth in Barnstable County, southeastern Massachusetts, near to Cape Cod. A major whaling town, the Falmouth in Barnstable County was settled by the Quakers in 1661 and was named for the Falmouth in England. The story of Falmouth, Trelawny after 1790 was one of prosperity. In 1794, Moulton Barrett donated 7,800 square feet of land along the intersection of Duke Street and Pitt Street for the construction of an Anglican church, the St. Peters Anglican Church, and in 1799, the inhabitants petitioned the government for the establishment of a proper water supply system to serve the town. The petition was granted, based on the collection of local taxes sufficient to meet the expenses of building the water system. Back then, community based development was a real option, not a catchphrase for government incompetence. Falmouth became one of the first areas in the island to enjoy piped water, which was pumped from the centre of the town up until 1950, at a place appropriately named Water Square. Falmouth enjoyed piped water before the citizens of New York City did, though this was probably less significant than it is today. Later on, a Sea Tank, which operated until the mid-nineteenth century, was built a few miles offshore to supply ships with water. In 1814, the Trelawny Town Council paid the heirs of Moulton Barrett £100 currency for land on which to build the Falmouth Courthouse. The previous Courthouse had been housed informally at the corner of Duke and Market Streets, a block away from Water Square, and construction on the new Courthouse began in August 1815, the same year that the fancy Town Hall was built, and in April 1817, it was finished. Along with the Town Hall, Post Office and Printing House, the Courthouse was among the first set of important public buildings in Falmouth and the entire project cost the Town Council about £20,000. In 1926, the Courthouse had to be restored after a fire destroyed most of it. Falmouth was also the home of the largest market in the island, the Albert George Market. 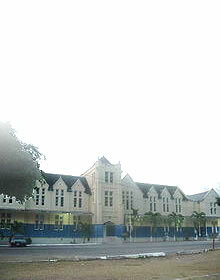 Built in 1894, the Albert George Market was named after the grandsons of Queen Victoria: Albert, Duke of Clarence and his younger brother George, who later became King George V. Today, the market is a modest shopping and historical centre with boundless potential for generating income, both local and foreign. The five printing presses operating in Falmouth by the mid-nineteenth century also kept the inhabitants well informed of local and international events: the Baptist Herald, Cornwall Chronicle, Cornwall Gazette, Falmouth Post and Falmouth Gazette. The Falmouth Post was established by John Castello in 1835 and existed until 1876, just one year before Castello died. The Printing House on Cornwall Street, built in 1850, at one time housed the offices of the Post. Falmouth was operating as a free port in the early 1800's. This meant that it was exempted from charging certain types of tariffs collected at other ports throughout the island. This encouraged many ships to dock at Falmouth Harbour, bringing with them a number of undesirable individuals, especially white sailors who were often drunk and disorderly. The Stone Cage near to the harbour was built to hold these drunken, disorderly sailors, and later, when Fort Balcarres was built adjacent to Charlotte Street overlooking the sea, that function was transported there. Fort Balcarres has been the site of a primary school in recent years. The Phoenix Foundry was one of the earliest in the island. It was established in 1810, nearly twenty years after the foundry in St. Thomas-in-the-East. The primary function of the Phoenix Foundry was to repair ships docked at Falmouth Harbour, but it also repaired boilers, pans and other sugar manufacturing equipment. The establishment of the foundry showed that the commercial enterprises in the new capital spanned more than just the sugar industry. The first Masonic Temple in the island was also built at Falmouth in 1798, with limestone blocks and charming stonework. Shortly after completion, the Temple was sold to the Baptist Missionary Society and became the Baptist Manse. The expense of the project may explain why it was sold. Once the home of William Knibb (1804-1845), Baptist missionary, the Manse, along with the Baptist Church built several years before it, has been mentioned in connection with Samuel Sharpe's rebellion in December 1831. Knibb died in 1845 and was buried at the Baptist Church. Mary, his wife, died in 1866 and was buried there as well. As a missionary, Knibb had the opportunity to observe many areas in the island, and Falmouth impressed him enough to record his opinion of it in 1830. According to him, Falmouth was "a pleasant, fashionable seaport town with from 2,000 to 3,000 inhabitants." Knibb was not the only person to write favourably about Falmouth. In 1794, Bryan Edwards had recorded his astonishment at the rapid development of the town. Twenty-three years before that, Falmouth contained less than 20 houses and cleared about 10 ships annually, and by 1794, the number of houses reached 220 and the number of ships cleared reached 30. In 1837, Joseph Sturge and Thomas Harvey called it a town of "increasing size and importance," but the most flattering appraisal came from a local newspaper. According to the West Indian Review, "Falmouth developed in the days when sugar was king and it has much of the charm of the Eighteenth Century in its Court House, in its wrought iron balconies, its colonnades and overhanging storeys." The lots in Falmouth were sold to wealthy planters and merchants, and John Tharp was one such planter. He owned a number of estates in Trelawny and he assisted Moulton Barrett and his brother Samuel with selling the lots in Falmouth. Tharp was also Custos of Trelawny, until 1795, when a series of personal tragedies and ill health forced him to resign. He built two houses and a wharf in Falmouth, and one house is currently the Office of the Collector of Tax. The wharf made him the most self-sufficient planter in the island, because it was rare for a planter to build a wharf, but Tharp wanted control over both ends of the sugar business, and after building the wharf, he went into slave trading, another exceptional venture for a planter, and made a handsome profit from the importation of 400 Ibos in 1782. Tharp died on July 30, 1804, just months after bringing another batch of Ibos into the island. His wharf still stands as a reminder of his prosperity, and there is Tharp Street, which was named after him. Steamboats began to arrive in Jamaica in the 1830's, and it signaled the end of Falmouth as a major port town. These bulky vessels needed deeper waters to dock, and Falmouth Harbour was not deep enough. Several attempts were made to deepen the harbour, but Falmouth never regained its former glory. Railway transportation was introduced into Western Jamaica in the 1890's, and because Falmouth could not handle steamboats, the town was bypassed for Montego Bay. 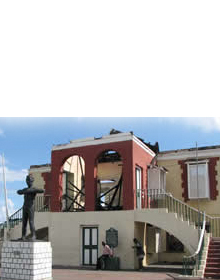 Under the Jamaica National Heritage Trust Act of 1985, a section of Falmouth, recognised as rich architectural and archeological heritage, was declared as a National Monument on September 5, 1996.